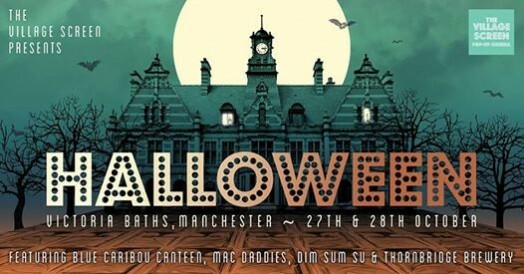 The spooky season is just around the corner and The Village Screen are celebrating in style by transforming Victoria Baths into a stunning Halloween cinema. They are popping up on Friday 27th and Saturday 28th October at Victoria Baths with screenings of Hocus Pocus, The Addams Family and Beetlejuice. Dress up in your greatest Halloween outfits, snuggle up in your cuddliest of blankets and watch a classic Halloween film in a stunning location. DJ Matt Hydes will be spinning the spooky tunes at each event plus they'll be joined by street food traders The Blue Caribou Canteen, Mac Daddies and Dim Sum Su. The Village Screen bar will be open serving prosecco, wine, cocktails, craft beers, soft drinks, hot drinks, popcorn and fresh doughnuts. Please wrap up warm and bring blankets as Victoria Baths is unheated. How to buy tickets: Tickets are available to purchase via the link below.